From bathroom tiles to bathroom vanities, get a complete bathroom renovation that will transform your current bathroom into an area that you love. Looking for other home renovations? We provide all home building services from new home constructions to kitchen renovations and laundry renovations. Whether you need a sturdy bathroom that can handle the attack of your children or a place to relax after a hard days of work. 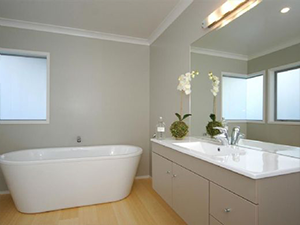 We incorporate your bathroom ideas into your bathroom design to ensure you are completely satisfied. Covering everything from showers and mirrors to tiling and flooring. You get a complete bathroom renovation package from experienced home builders who can ensure a professional service and outcome. You need to know that all the tradesmen working on your home renovation are professional and capable of completing the job to your standards. All our sub contractors are at the top of their field and are more than capable of completing any tasks. Helping to save you money down the line with top quality waterproofing for tiling and other affected areas. Rest assured that all waterproofing is installed correctly by certified waterproofing installers.